This week we celebrated my youngest daughter’s 5th birthday. To me, 5 is that number where a child is no longer a “baby”, or even a “toddler”… they’re a kid. And in this particular case, when your 5 year old shares clothes with her almost 8 year old sister, and would probably be well suited to play pee-wee football (based on both size and personality)… she hasn’t been much of a “baby” for a while! I love seeing my children grow, but of course it’s somewhat bittersweet. Last year I put together a fun Ladybug Birthday Party for Joy. We generally do “big” parties for our girls every other year, so this is her “little” party year. We celebrated with two of Joy’s little friends (along with our daughter, Grace), and enjoy cake and presents at home, then headed to a local indoor trampoline “park”. When I asked my daughter what she wanted as a birthday cake the list was quite long and ranged from butterflies, to dragonflies, to rainbows, to pink and purple… so I had to narrow it down a bit and hope she’d be happy with it. I think the end result was very sweet and would work quite well for almost any age woman who loves pretty and feminine things. For the outside of the cake I tried a fun decorating technique I first saw on My Cake School. I was very pleased that it was quite easy to execute and I think I’ll definitely try it again. It’s quite quick, and I think it creates a beautiful, and unique look. 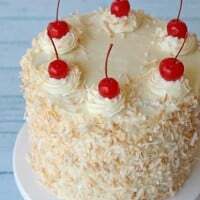 Updated: I loved this decorating technique so much (called the “petal effect”) I used it again for a pretty Lemon Cake, and have included some step-by-step photos in that post. I dressed up the frosted cake even further with fondant butterflies in pink and purple tones. I’ll try to do a tutorial on the butterflies very soon. A few pretty candles (available at Sur la Table, or Shop Sweet Lulu) finished the cake and added an additional element of pink and purple. Happy birthday to my sweet Joy… who will always be my “baby”! she is adorable, it is so hard to see them grow out of the baby stage, they are always going to be our babies. And I love the effect on the cake I must try that. Aww babies turning 5 sigh. It is sad and happy. 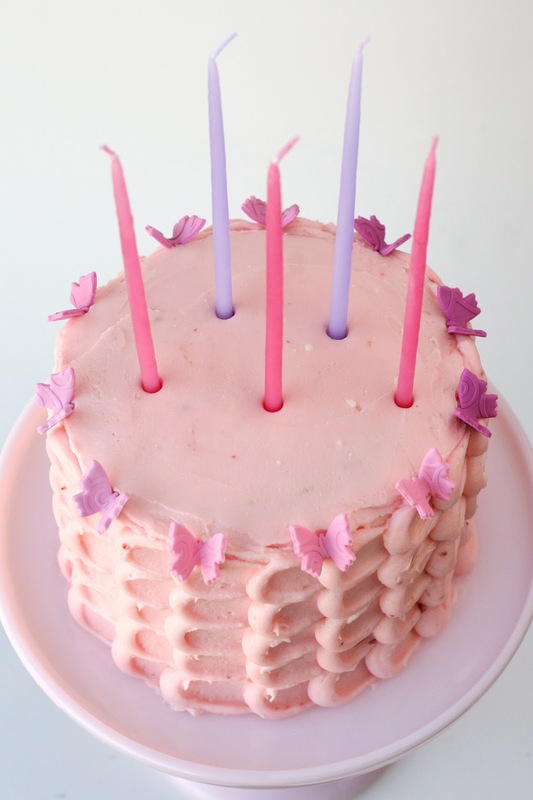 Truly a pretty cake! She looks positively elated!! Such a pretty cake for a pretty girl! The colors are perfect and I love the design on the side. My baby is turning 4 in a couple week. It is especially hard when it it the last baby growing up! Simply beautiful! My daughter is turning 6 next month and this would be great, but she's having an animal party and doesn't want a girly cake. What is a mom to do?? 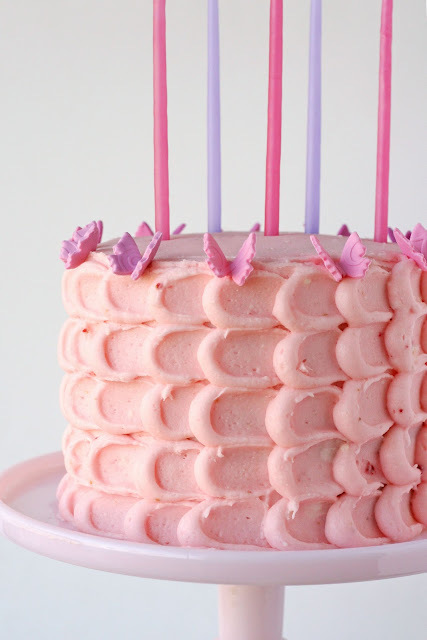 Such a pretty cake! I'm a My Cake School subscriber too – I think it's great, such an invaluable resource! What a lovely cake! Good job! I'll be making a cake for my daughter's 13th birthday next week…talk about bittersweet! Your little girl is GORGEOUS!! I bet she loved this cake, it's so perfect. Love that petal technique, it's really cool!! Wow this cake is so beautiful! I love the petal effect! She's beautiful! Happy Birthday to your lovely girl. 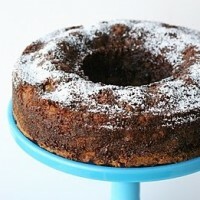 oh, this cake is beautiful! 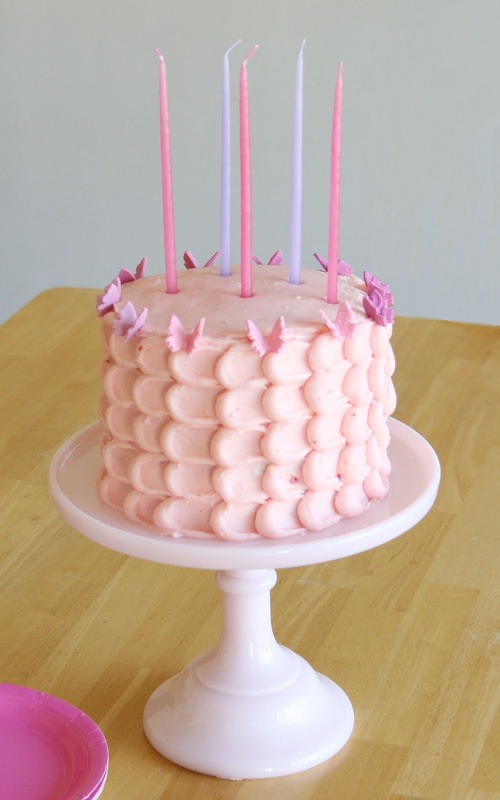 i love the tall candles, too – such a perfect addition. happy birthday to your daughter! Happy birthday, Joy! You almost upstage the cake! It's beautiful! I love the pink and purple together. Kids birthdays are always so much fun! I follow your blog and am always in awe…but today it is triple awe. That cake is just spectacular. Joy is a very lucky little girl. Happy Birthday to your little girl. BEAUTIFUL! Happy Birthday Joy! Your parents picked the perfect name for you since you really do bring JOY everywhere you go! I love you sweet little girl! Can't believe I met your mom when she was preggo with you – it seems we have been friends much longer! what a sweet cake. Loce the pleet effect. Happy birthday to you little princess . Such a sweet cake for a sweet girl. My youngest turns 4 in two weeks, so I feel what you're going through. Happy Birthday to the beautiful girl! Happy Birthday! A beautiful cake for a beautiful daughter! That looks amazing. I wish I could try that cake. Happy Birthday to Joy !! She´s beautiful. I discovered you blog recently. I´m from Argentina, living en Cancún (México). Sorry if my english is not perfect. I´m trying to practice it. I think the technique is great ! I loved it. Happy Birthday Joy!! I hope you birthday is as sweet as your mother's cupcakes!! So cute! Happy birthday to her and congratulations to you for all your work! I love this cake and I love the picture with Joy in it. I can see that she was very happy with the results. This is awesome! Love your work! Soooooo Pretty!!! I want that to be my birthday cake! This cake is gorgeous! I've been following your blog for a while, such an inspiration! I work at a primarily bread-muffin-bagel bakery, but I've started decorating special order cupcakes and cakes! I have to admit, I've used some of your ideas for inspiration on several occasions, especially the hydrangea one! It is so beautiful..Love the pretty pink color! Belated Happy Birthday to Joy.Lovely cake, love the petal technique. I'm wondering about the flavor of the cake and the frosting . 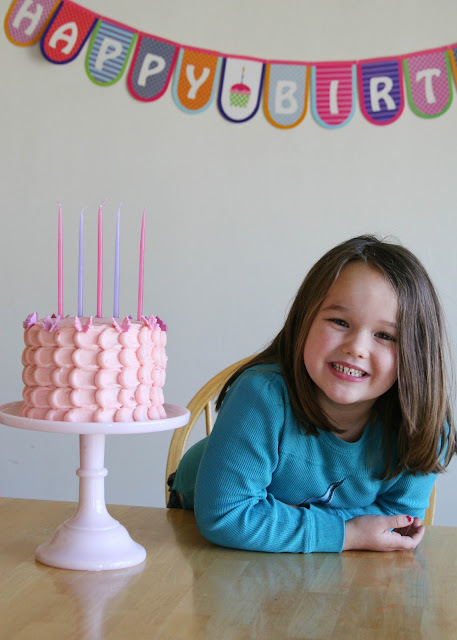 Gorgeous and what a beautiful picture of your daughter next to her cake! Sweetie! To me, it's when they lose their baby teeth that everything changes. For boys it's when they get hairy legs. They seem so different and yet still your little babies. Beautiful cake! happy birthday sweetheart! you deserve the best! Pingback: Happy Birthday to Happy!!!! 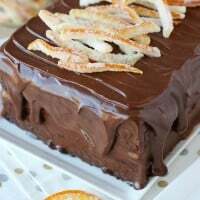 Could you do this with cream cheese frosting? Hi Misty, Yes, you can do this with cream cheese frosting, just make sure not too add too much liquid, so the frosting stays nice and thick. Also, as you’re working the heat of your hand may cause the frosting to become a bit too soft, so just wrap the piping tip with a moist paper towel (so the frosting in the tip doesn’t dry out) and put the whole piping bag in the fridge for 15 minutes or so.